Oatmeal Cherry Quick Bread: I wanted the quick bread to have healthy ingredients like organic whole oats (iron and fiber), ground flaxseed (fiber, Omega-3s), coconut oil (kills hunger, multiple health benefits) and the fresh cherries (fiber, wards off cancer, inflammation reduction, low glycemic index) that I keep bumping into at the grocery store lately. Disclosure: Some links in this post are affiliate links which means I earn a commission if you purchase through them at no extra cost to you. I only recommend brands and products that I 100% like and enjoy using. Thank you in advance for your support! I also include links for informational purposes. 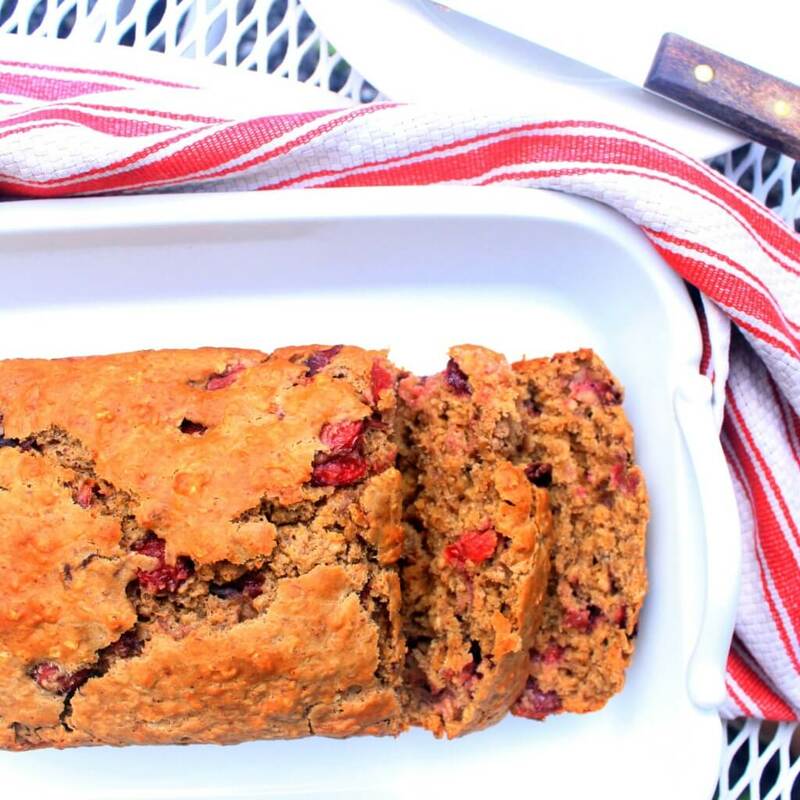 I was hankering for some kind of healthy, energy-giving, quick bread that I could visit and revisit throughout the day while chasing my 14 1/2 month old toddler who is into everything these days. I wanted the quick bread to have healthy ingredients like organic whole oats (iron and fiber), ground flaxseed (fiber, Omega-3s), coconut oil (kills hunger, multiple health benefits) and the fresh cherries (fiber, wards off cancer, inflammation reduction, low glycemic index) that I keep bumping into at the grocery store lately. This recipe is lactating-mom friendly, meaning it has ingredients like oatmeal and flaxseed which supports the nutritional needs of a lactating mother. But really, anyone can eat and enjoy it. My husband, Eric (the lactose-intolerant member of the family), liked it and my toddler, Margo (the bread lover), enjoyed it as well. She normally doesn’t eat raw cherries but she went for them when they are baked into bread! For the ground flaxseed, I used Hodgson Mill Ground Flaxseed. For the coconut milk, I used So Delicious Unsweetened Coconut Milk. For the coconut sugar, I used Madhava Coconut Sugar. 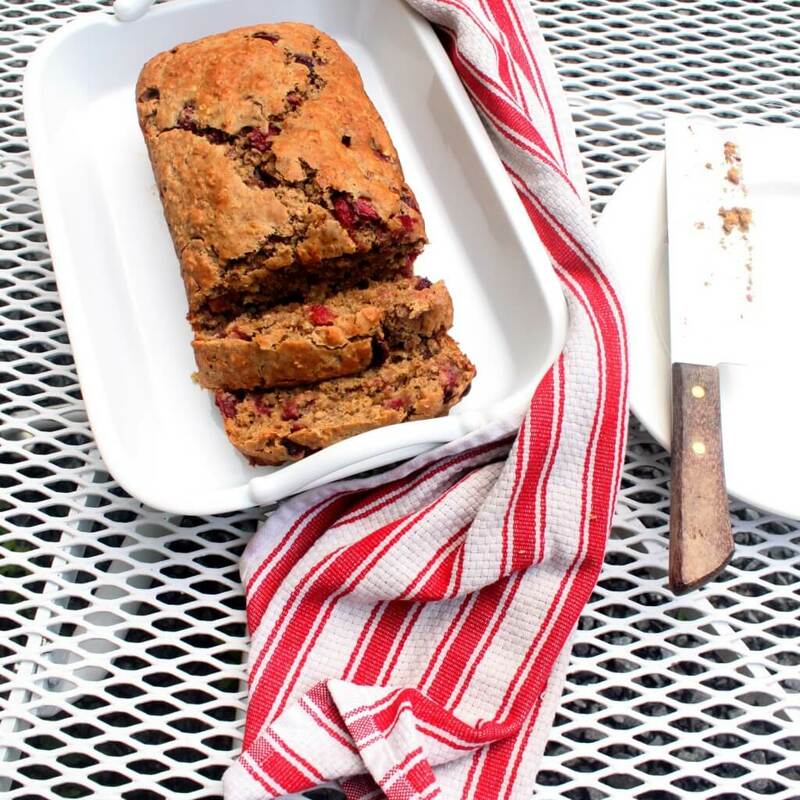 Though Oatmeal Cherry Quick Bread has 1/2 a cup coconut sugar (the original recipe calls for 1 cup regular refined sugar), it’s not a super sweet bread and doesn’t leave an overly sugary taste in your mouth. There are large chunks of cherries which add a lightly sweet and tart flavor. This bread is moist almost like how banana bread can be but not mushy in any way. The color is golden and it’s so pretty with those bright red cherries peeking through. Eating this bread is like eating cake without any guilt and made better by biting into juicy and delicious cherries. • View my tutorial on how to prepare a Flaxseed “Egg” here. Oatmeal Cherry Quick Bread is dairy-free, lactating mom-friendly, loaded with healthy ingredients and great for breakfast & snacking. No electric mixer required! Preheat oven to 350 degrees F. Grease a 9x5x3 inch loaf pan with coconut oil and set aside. Using a large bowl, mix flour, coconut sugar, baking powder, ground flaxseed, sea salt and cinnamon until combined. Using your hands mix in coconut oil until mixture is crumbly. In a small-medium bowl, mix egg, coconut milk and then add the pitted ripped in half cherries. Add egg mixture to the flour mixture and mix until just combined. Using a baking spatula, scrape the batter into the loaf pan and spread evenly. Bake for 50 to 55 minutes. To test for doneness, use a wooden toothpick, insert into center and if it comes out clean then it's done. Cool in the pan for 10 minutes, then take loaf out of pan (be careful, bread may still be hot) and cool on a wire rack completely before slicing. Store in an airtight container for up to 3 days. If you have a different size quick bread pan other than the one noted in the recipe, make sure to adjust for baking times. If you don’t have coconut oil, you can substitute canola oil instead. If you want the bread to be more sweet, perhaps more of a dessert bread, you can do up to 1 cup of sugar vs. the 1/2 cup that I specify. Kosher or regular salt can be substituted for sea salt. I like the more complex taste of sea salt, so that’s why I use it but it’s really a background flavor in this particular recipe. Make sure to get all the pits out when you pit the cherries. Pitting them by hand keeps more of the flesh than cutting them (I’ve tried both methods). Use your thumbs at the top of the cherry, split them in half, take the pit out and shred the flesh slightly with your fingers. Messy but worth it. Brewer’s yeast would also help make this bread even more of a lactating mom-friendly recipe; I haven’t tried using it with this recipe but I do have some on order that I will test out. Random fact: National Cherry Day is July 16th in the United Kingdom. Thank you Sarah! It’s like a cake you don’t have to feel guilty about! Hi Razena, yes, I certainly ate this for breakfast! Thank you for stopping by! Looks great; we love how you can take this recipe and make it your own by adding whatever fruit is in season or on hand. Nicely done!! This makes me so happy! I just recently discovered my love for cherries and have been putting them in everything. Haven’t tried a sweet bread though, thanks for an awesome idea! Ooohhhh – This looks perfect for the fall weather that is quickly approaching. Yum! Hi Erin! Thanks for stopping by! Yes, warm bread on a Fall day, Mmmmm! Yum, I love both cherries and quick breads. Looks like I need to make this! Hi Renee! Thank you for stopping by! I checked out your website, I like your recipes and your food photography! 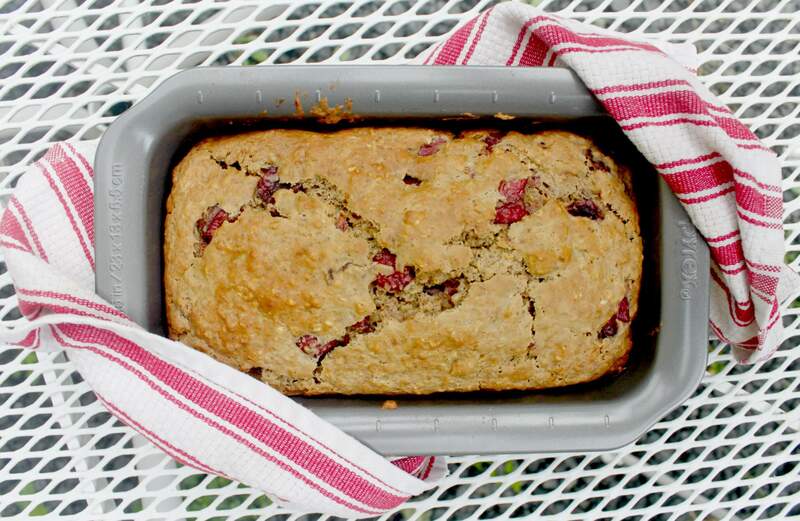 Oatmeal breads are so healthy and yum – the combination of cherries will surely make them even more delicious. Great recipe. Hi Molly, I am so glad that you share my view of oatmeal breads! Thank you! Wonderful looking bread! I am a huge fan of cherries too so win win! Hi Chris, Thank you so much for stopping by! This bread looks super healthy and delicious! Yum! Hi Byron, thank you so much! In addition to being healthy, it looks like it would be delicious! Hi Lauren, thank you for stopping by my blog, I love your blog BTW! What a nice combination of flavors! I so wish i could make this. Cherries are with us for such a sort little time , so unfair just like peaches. This looks scrumptious ! I know, I can’t wait for cherry season again! Awesome. Really easy to follow. Try this for sure. Hi Derek, I am glad that you think it’s easy to follow, thank you for visiting my blog! What a wonderful looking bread! I would love this for breakfast or a snack!! Hello Cassandrea, thank you for visiting! FINALLY got me a loaf pan and I definitely want to let it flex its muscles beyond my typical banana bread loaf. This looks like a perfect next step!! Hi Hillary! Thank you for stopping by, it’s nice to see you outside of your Chicory e-mail updates! I stopped by your blog yesterday and had a look around, I LOVE your food BTW. Oh my word! This sounds absolutely delicious! This bread sounds so yummy and I love that you use coconut oil- I use it in everything!! Hi Kelley, isn’t coconut oil the best? It works great in a quick bread! Hi Shobelyn, yes this bread works really well for breakfast, thank you for visiting! This is my kind of recipe! I love that you cook with coconut oil. Also the coconut milk looks great in this with those yummy fresh cherries. I want to eat this bread! Diane, I am so glad that you like it 🙂 Yeah, I LOVE coconut oil, it’s the best! This looks like the perfect breakfast! I love the nutty flavor of oatmeal and I imagine it would be perfect with the cherries. Hi Marye, thank you so much! Oatmeal: one of my favorite things on earth! Can’t wait to try it this way ? I love quick breads and this looks so good. Hi Oana, here’s a virtual slice! Thank you for visiting my blog! I use a paperclip to pit my cherries, but if you’re going to cut them in half anyway, using your bare hands is fun! This loaf would be awesome with so many different fruits. Thanks for sharing a vegan version. Hi Lydia, I have never used a paper clip, I will have to try that to experiment. Thanks for visiting my blog! Yum! This looks like a delicious sweet bread! Yum! Hey J, I just stopped by your blog after I saw this comment, I love your blogs design, recipes and your photos! Thank you for stopping by! Oh, I love that this has oatmeal in it! This would be perfect to bake and take to new moms. Yes, I agree Jessica, new moms should always have someone baking for them! Hi Rachel, I know aren’t quick breads amazing! I have been loving making them lately! So versatile! I love quick breads! Yours looks absolutely delicious! This looks like it would make a delicious, and healthy, afternoon snack! Hi Kathryn, yes, this was my afternoon snack in cherry season! Damn! Cherry season just got over here, but that bread looks fantastic. 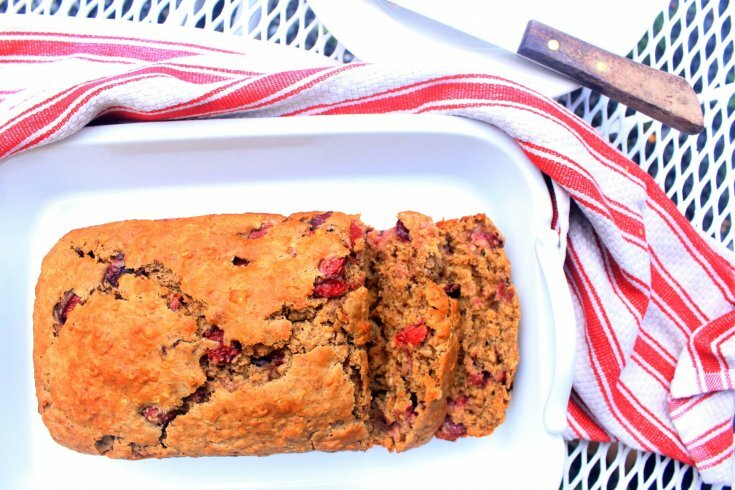 This bread sounds so yummy, yet so healthy, I love the cherries in here. Hi Katalina, yeah you can’t go wrong with cherries! Thank you! This sounds amazing! I’m a big coconut oil fan and I love the idea of the flax as an egg replacement. I’ve printed this recipe out for future reference. Thanks. Hi Tina! Isn’t coconut oil the best? I love cooking/baking with it and I only started a under 2 years ago. It’s just so versatile. Thank you for visiting! I LOVE cherries!! This bread looks delicious and easy! Yum! I know aren’t they so great? When I eat cherries I am thinking about how many vitamins are in them besides how great they taste! This sounds like such a great combination of flavors and so easy to make! Thanks for the recipe! Hi Sabrina! Thank you for stopping by the blog! I love quick breads especially when they are healthy as yours. Love flax seeds and use them as egg replacer. Hi Michelle, yes I hope this idea really catches on, I am trying to spread the word! Thank you for stopping by! Looks great! I have little ones too, so I’m definitely into recipes like this!! Hello Chrissie, I am so glad that my recipe can be helpful to you! Thank you for visiting. Cherries in baked goods, especially bread, is a favorite! It pairs so well. This recipe sounds truly incredibly! Hello Lalaine, you are so welcome and thank you for stopping in! Hi Lauren, I plan to be sharing more lactation-friendly recipes like this which would be good for new moms & busy moms that need healthy snacks. I feel like recipes like this are becoming more my “niche.” Filling that sort of need is definitely close to my heart as a mom! Thank you for your kind comment and visiting my blog!